We use electricity constantly in our daily lives. It is one of the most important types of power and energy that we use. Electricity travels to our house over power lines from a big power plant somewhere far away. Your parents actually have to pay for how much electricity is used. There is an electric meter outside of your house that keeps track of this. The more the lights are on or the TV is running, the higher the bill will be from the electric company. Once the power comes to our house, it gets sent out on wires to sockets in the walls. We can plug all sorts of things into these sockets and use the power from electricity. In our homes we power lights, air conditioning, televisions, ovens, and more from electricity. Without it, we'd be bored, hot, and sitting in the dark. Some electricity comes from batteries. Batteries use chemicals to store up electricity that can power devices like cell phones, radio controlled cars, handheld video games, and flashlights. Batteries run out of power after a while and either need to be recharged or recycled. Remember to always recycle your batteries as there are dangerous chemicals in them! Electricity is used in cars too. There is a big battery to help the engine get started. Then the engine generates electricity for the radio, lights, and other cool features. Some cars run 100% on electricity by using big batteries that get charged up from a wall socket. Electricity also can make magnetism. This can be used to create giant powerful magnets as well as fast and quiet magnetic trains. Electric motors generate magnetism to turn the motor and cause movement for all sorts of uses. One of the first great uses of electricity was for communication using Morse Code and the Telegraph in 1840. This allowed messages to be sent long distances in an instant. After that came the telephone and the radio and, in 1880, electric light. These inventions and the use of electricity changed the world. Electricity continued to change the world with new inventions such as the TV and, even more recently, the personal computer and the cell phone. 25% of the city of San Francisco's energy is generated by wind power. Electric eels use electricity to ward off enemies. They can produce a shock of around 500 volts. Our bodies use electricity to communicate including telling our heart to keep beating. Two famous scientists, Thomas Edison and Nikola Tesla, once had an argument over what kind of electricity we should use in our homes, AC or DC. Tesla won and AC is delivered to most homes still today. 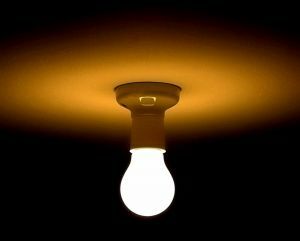 Electricity was first used in homes for lighting.